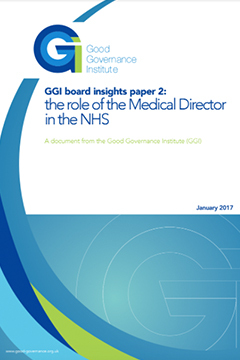 This paper explores the role of the Medical Director in acute trusts in the NHS, and is part of an insight series produced by GGI on the key board roles within the NHS. With the increasing significance that has been attributed to clinical leadership over recent years, the role of the Medical Director is widely seen as more important than ever. Despite this, there appears to be a lack of clarity about the role, and also significant barriers to its uptake, most pertinently the issue of career progression and succession planning. what makes an effective medical director?